The July recipe at the Paper Mixing Bowl was strawberry shortcake. 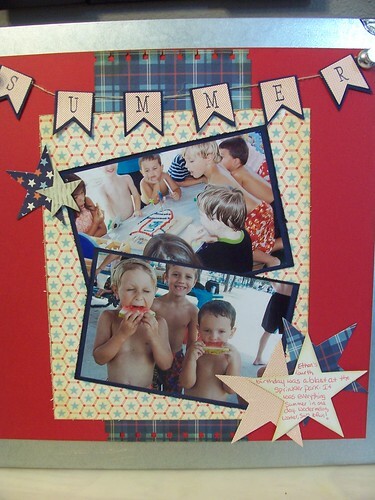 I don't usually have Fourth of July pictures to scrapbook. I seem to forget to get the camera out and usually we are just watching or shooting fireworks and they just don't photograph well for me. I thought these pictures from a summer birthday (rocket themed) we attended would fit the bill. I used several of the "utensils" from this recipe. I made a banner for the title on the lead page. I strung the banner on a piece of twine. I am really loving all the banners out there right now. 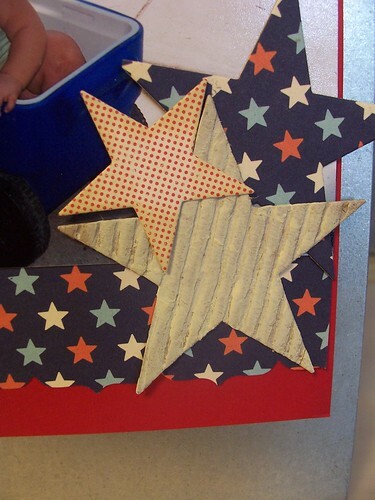 I also used star shapes cut from various patterned papers and included my journaling on a star. I worked with contrasting patterns and created a couple of die cut stars out of corrugated cardstock that I pained cream. I rarely find scrapbook layout sketches that include a second page and our lives are too busy to fit on just one page. I find it easy to allow a great sketch become the lead page and the second page a complimentary page. For this second page I blocked my photos in the center of the page. 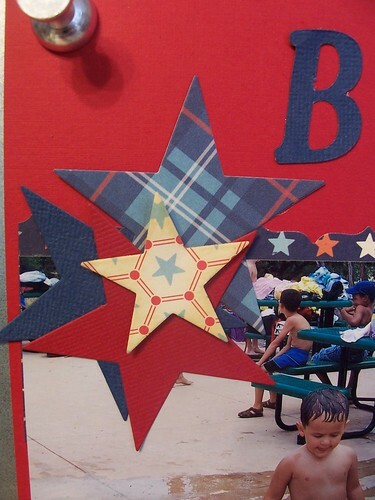 Then I pulled some of the elements from the first page with star die cuts from the various patterns. Love your take on the sketch Sara!! Great fun photos and love the banner. Thanks for playing at PMB!! Fabulous take on the recipe! 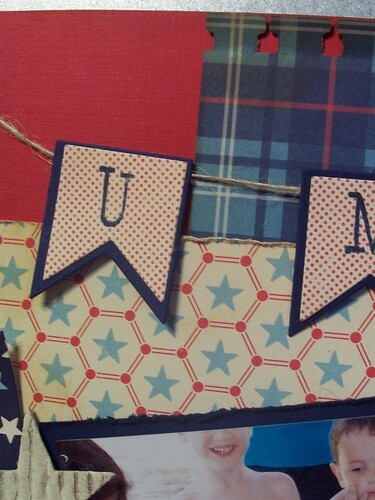 I love how you made it into a 2 pager!Great banner and stars too! I also like that you were able to choose photos that were summery and not necessarily patriotic. 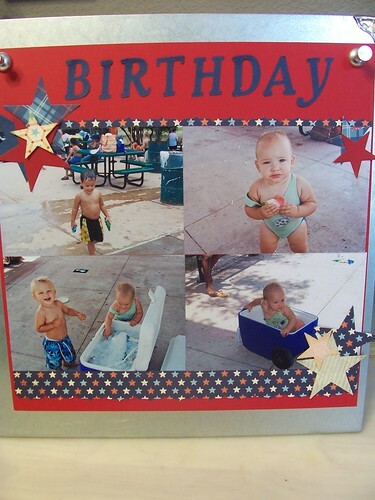 Great LO - adorable photos and I love the banner and stars! 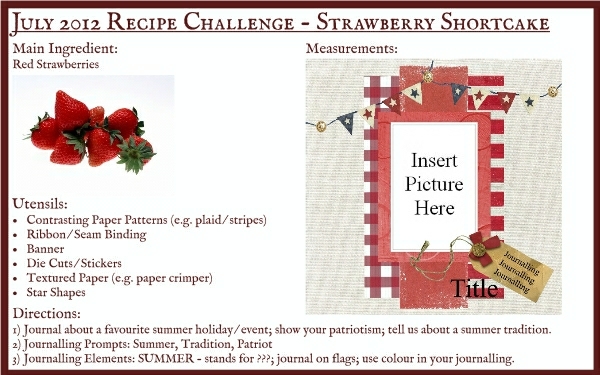 GREAT take on this month's recipe - thanks so much for playing along with us at The Paper Mixing Bowl! Great use of the challenge recipe... Thanks for playing along with us at The Paper Mixing Bowl.